The X-Ride from Aerobike combines the joy of traditional cycling with an intuitive 250w motor for a smoother ride. Hop on, and from the moment you first pedal, the motor, housed in the front wheel, will give you a helping hand. It accelerates you up to 15mph, but you can pedal faster if you want to. You're always in control. Charged in just 3 hours, and able to give you up to 30 miles on a full battery, you have the power to truly explore. Sleekly located where the water bottle holder would be, the lithium ion battery works together with the motor and computer to help you go further. Thanks to the SRAM Automatix, a shifter that dynamically adjusts gears depending on your speed, you'll always be pedaling at a comfortable speed. There's no messy gear shifting as it's all done automatically. No stress, and no fuss. Further - 30-mile range on a full battery. Faster - assistance up to 15mph, but pedal more for more speed. Safer - better gear shifting and a smoother ride means a safer journey. Smarter - cycling you know; with a helping hand you'll love. The X-Ride, from Aerobike, is a power assisted eBike that lets you go further. Enjoy cycling and get ready to explore. It's the cycling you know, but with a hidden helping hand you'll come to love. Torque sensors and an advanced computer work together to analyse your pedal power, and when you're really pedalling hard, the bike pushers harder. How does it push harder? Well that's the clever bit. To make sure you're always pedalling comfortably, there is a SRAM Automatix gear changing system. This clever device knows when you need to change gear, and does it for you, meaning safer, more efficient cycling. 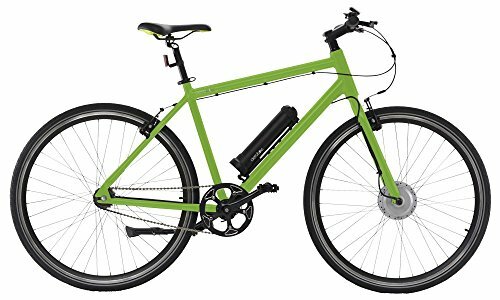 The lithium-ion battery, cleverly located in the space where the water bottle holder would be, is fully charged in 3 hours, and when it's full, you'll get 30 miles of cycling. So you can make that commute, combat hills easily or just explore for many miles. We also sell Aerobike Accessories Mudguard, Spare Battery, Charger, Brake Levers, Grips and Tyres.